Celebrating 50 years of Rock 'N' Roll! 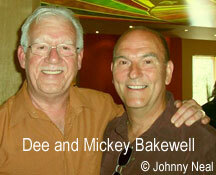 A reunion was held on July 16, 2006 at the Yew Tree Bar and Restaurant in Yardley, Birmingham, to celebrate Johnny Neal's 50 years in the rock 'n' roll/showbusiness idiom. 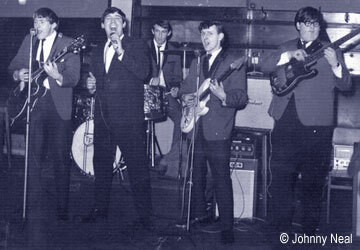 Johnny formed Birmingham's first authentic rock 'n' roll band 50 years ago known as "Johnny Neal and The Houn'dogs". There were a few skiffle and rhythm groups around at the time, but none with a sax, double bass, guitar and drums line up and playing rock 'n' roll like the Houn'dogs, which was revolutionary at the time. Johnny went on to form "The Johnny Neal Six", "Johnny Neal and The Beatnics" and finally "Johnny Neal and The Starliners"
The reunion brought together musicians from the 4 band names. Guest of Honour was Graham Dunnet, who, with his wife, flew in from Canada, where he became a star in his own right as Dee and The Yeomen, with several number one hits there. Graham was the original guitarist with the Starliners and also a founder member. 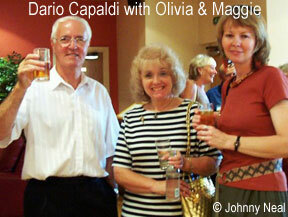 Group members came from all over the UK and beyond to attend, and a good time was had by all. So much so, that the guys want to meet up again soon, rehearse and record something for posterity, and some are already flexing muscles that they had forgotten they had, busy practicing!! 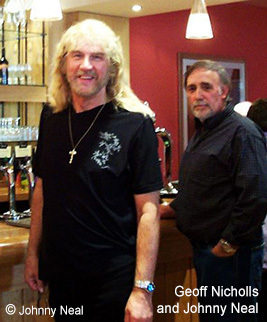 A DVD was shot of the Reunion by Geoff Nicholls (who was with Johnny for 5 years with the Starliners and then went on to Black Sabbath). Tony Martin (ex-vocalist with Black Sabbath) edited the DVD and Johnny is grateful to them both. In addition, Keith Dolloway, who wrote the group's single And I Will Love You, produced a great DVD of still photos of 'then and now' shots. Both DVD's have soundtracks of recordings of Johnny and the boys. 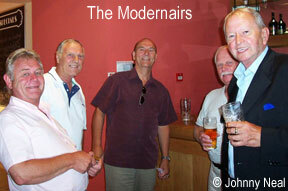 Apart from the guys and their partners, members of The Modernairs, The Boulevards, and Fairport Convention attended the reunion, together with Johnny's personal roadie Clive Deacon ("The Captain") and Phil ("Jason King") who provided the Starliners stage clothes. Apologies for non-attendance for illness/other commitments etc. were received from: John Singer, ex-manager, from Spain; Roger "Moon" Shaw, from Turkey; Roger Craythorne, from South Africa, Brian Sharp, Eddie Peppal, Alan "Clog" Clifford, and Stuart Duncan (Tiny Tim), from the UK (the latter 2 Johnny has visited recently). As a further consequence of the reunion, Johnny has been contacted by someone interested in releasing some of the group's demo tapes, so attics were searched, cellars raided and... Keith Dolloway came up with some rare photos (lots of them), Alan Clifford found the original demo of And I Will Love You/Walk Baby Walk (recorded at Hollick and Taylor, plus four titles recorded at Jim Tetlows studio on the Stratford Road). Also, Johnny found the audition tape he made for ITV in London when he was invited to audition for a place in the 4 man team to represent the UK at the Knokke Festival in Belgium. The biggest scoop of all was by Graham Dunnet in Canada, pulling a rabbit out of the hat with a reel of film by Pathe Pictorial - "Look at Life" series, depicting life at Reg Calvert's Pop School in Rugby in the early 60's, which was shown on the big screen world-wide and featured amongst others, "Danny Storm and the Strollers" plus The Fortunes, Johnny Neal, Tanya Day, Graham Dunnet and Ian "Monk" Mutch, (together with a close-up of his right hand playing piano!!). Also featured were shots of the Two I's Coffee Bar in London, where it all began, with young people drinking coffee, surrounded by photos of artists who had appeared there such as Cliff Richard, Adam Faith, Vince Taylor and Tommy Steele, A RARE FIND INDEED, to add to the ever-growing collection of rock 'n' roll history in the UK and Johnny and the boys' part in it. 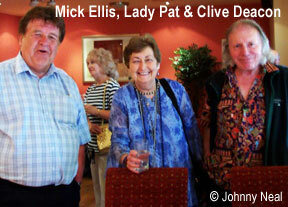 Thanks to Johnny Neal and his wife Maggie for sending the text and photos shown here of the Starliners reunion.